AeroFlite is a value-added facility and authorized distributor for Radiall, an international and global manufacturer, of interconnect components serving the Aerospace, Automotive, Defense, Industrial, Medical, Space, and Telecommunication industries. The Radiall DSX rack and panel series are multipin rectangular connectors used to electrically interface avionics equipment to equipment rack. 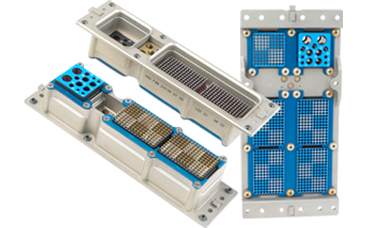 NSX Series (defined by ARINC 600 specifications) and BPX series (defined by Boeing S280W551 specification) are multipin rack and panel connectors used to connect high performance aeronautical equipments. The EPX® Series offers a wide range of solutions based on two insert sizes with a large variety of shells and contacts. The EPX® Series is completely modular and expandable. The EPX® Series connector is standardized by the EN4644 European standard. The miniature and subminiature rectangular multi-contact connectors meet the requirements of the standard MIL-C-2874 performance requirements. The connectors in each series consist of an insulator with male and female contacts which include several pin sizes. The Radiall MPX Series is a robust rectangular connector designed to meet all the requirements of the MIL-DTL85327B specification. The design conforms to the EN 3682. Quadrax is the best electrical solution for: High speed electrical network applications, excellent network performances, crosstalk, return loss, high density of links, harsh environment use.